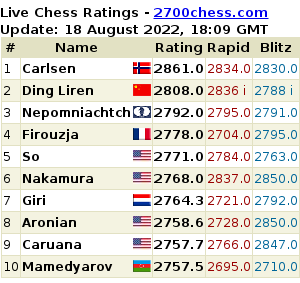 You may review the most recent games of chess players rated 2700+ in the tournaments box: please select the tournament and the round number, then click on a game to activate our chess board. Once you have finished reviewing a game, you can click on the "Select game" icon at the top left hand corner of the tournaments box to return to the tournaments list. Welcome to Live Chess Ratings! 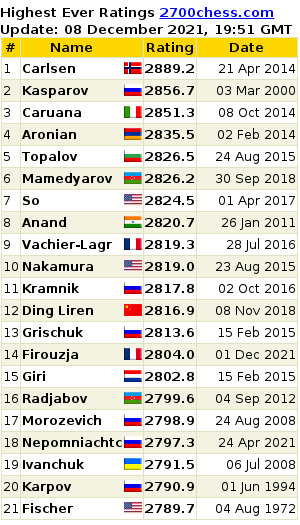 This website is dedicated to monitoring the live ratings of the top chess players in the world. We would also like to thank Annie Kappel for her help in improving text and layout. If there is any information that we may have missed that involves players rated 2700+, please contact us via email: info(at)2700chess.com.